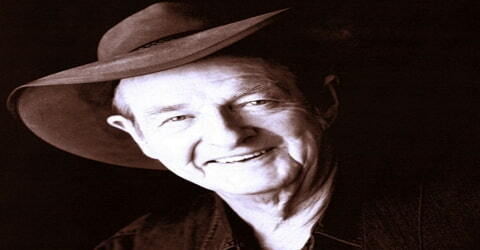 Slim Dusty – Australian country music singer-songwriter, guitarist and producer. Considered a true cultural icon of Australia, his music glorifies and celebrates the spirit of Australia. He is the quintessential ‘Father of County Music’ and has penned down over one thousand songs, recorded over hundred albums and sold over five million copies of these albums in the past seven decades earning more than seventy gold and platinum certifications. He is presumably the only artist to have recorded music on several formats starting from 78rpm to cassettes to DVDs and even on iTunes and ringtones. Some of his notable albums are ‘Slim Dusty Sings’, ‘G’Day, G’Day’ and ‘Beer Drinking Songs of Australia’. Many of his remarkable songs have become unofficial Australian anthems, most strikingly ‘A Pub with No Beer’ that made him the first Australian artist to receive a gold record. He is the recipient of the ‘Golden Guitar’ for an unparallel 37 times for his excellence in Australian country music. Dusty has received the ‘Australian Recording Industry Association’ (‘ARIA’) award twice. He was included in the ‘Country Music Roll of Renown’ as also in the ‘ARIA Hall of Fame’. During the closing ceremony of ‘Olympic Games’ in 2000, Sydney, he performed the Australian bush ballad, ‘Waltzing Matilda’. Considered as ‘Australian National Treasure’, Dusty received a formal state funeral upon his death. In 2007, his domestic record sales in Australia surpassed seven million. During his lifetime, Dusty was considered an Australian National Treasure. Slim Dusty, by name of David Gordon Kirkpatrick, was born on June 13, 1927, in Nulla Nulla Creek, New South Wales, in the family of a cattle farmer and amateur musician, ‘Noisy Dan’. His childhood home, “Homewood”, survives and is now heritage-listed. Dusty was known by his middle name, Gordon. 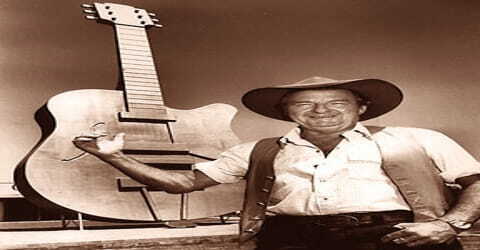 He wrote his first song “The Way the Cowboy Dies” in 1937 and adopted the stage name “Slim Dusty” in 1938 at age 11. Dusty was an enthusiast of country music and was inspired by works of Buddy Williams, Tex Morton, and Jimmie Rodgers. Around 1942, his father organized an audition for him at Sydney’s ‘Columbia Records’. Though two songs were recorded they failed to strike a chord with music lovers. He and Ranger began touring along with tent show groups till 1945 when Dusty had to return home following the sudden demise of his father. He started taking care of the family farm but still nurtured the dream of taking forward his musical career. In 1945, Dusty wrote “When the Rain Tumbles Down in July” and released his first record that year at the age of 19. In 1946, he signed his first recording contract with Columbia Graphophone for the Regal Zonophone label. 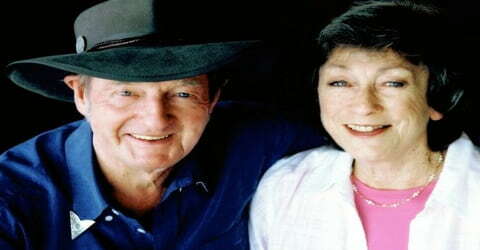 In 1951, Slim Dusty married Joy McKean, who was also a country singer and songwriter. With her help, Dusty achieved great success around Australia. 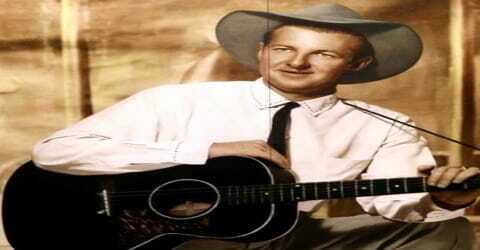 In 1954, the two launched a full-time business career, including the Slim Dusty Travelling Show. McKean was Dusty’s wife and manager for over 50 years. Together the couple had two children, Anne Kirkpatrick, and David Kirkpatrick who are also accomplished singer-songwriters. McKean wrote several of Dusty’s most popular songs, including “Lights On The Hill”, “Walk a Country Mile”, “Indian Pacific”, “Kelly’s Offsider”, “The Angel of Goulburn Hill” and “The Biggest Disappointment”. 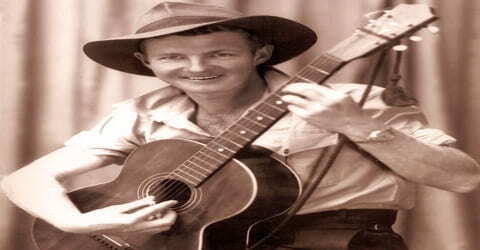 Slim Dusty recorded his first record, the patriotic “Song for the Aussies” (with “My Final Song” on the B-side), in 1942 and signed his first recording contract in 1946. He continued to work part-time as a ranch stockman until 1954 when he formed a full-time traveling show with his wife and other family members. Even though a skilled songwriter himself, he sang songs of many other writers including Gordon Parsons, Kelly Dixon, Stan Coster, and Mack Cormack. Apart from these, Dusty had also recorded poems in new tunes by prominent Australian poets, Banjo Paterson, and Henry Lawson. Nevertheless, the arrival of rock and roll music saw major metropolitan music radio stations abandon support for country artists, and despite record sales in the multimillions, after the 1950s, Dusty was rarely heard on-air outside regional centers in Australia. In 1954, Dusty and McKean launched his first traveling show, the ‘Slim Dusty Travelling show’. He and showman Frankie Foster set up a partnership in 1956 and started touring as a big tent show. The partnership, however, ended in 1963. By April 1957, Slim Dusty already had a recording career of ten-plus years behind him when he was scheduled to record four more songs, but only three had been chosen. At the time, Slim was traveling with Gordon Parsons, who was singing a song he’d written based on a poem by Dan Shean. Needing that extra song, Slim asked Parsons if he could record his song, thinking it would make a good B-side for a song called “Saddle Boy.” Parsons had no problem with that as to him, “A Pub With No Beer” was just a novelty song. Months later, while Slim was working in outback Queensland, he was told that the B-side of his latest single had made the pop charts in Brisbane, and as the months rolled on “A Pub With No Beer” became the first-ever Australian-made single to reach the national number one spot. The record went on to reach number three in England, and also sold well in the U.S. For a long time, it was the biggest selling single in Australian music history. In 1959 and 1960, Dutch and German cover versions of the song became number one hits (even evergreens) in Belgium, Austria and Germany, brought by the Flemish country singer-guitarist and amusement park founder Bobbejaan Schoepen. Albeit huge sales of records, country music took a backstage as rock and roll arrived with leading urban music stations mostly airing the new entrant. As a result post-1950s, Dusty’s songs were also heard rarely in urban stations. The first full-length album of Dusty, ‘Slim Dusty Sings’ was released in 1960. Slim Dusty recorded more than 100 albums, including Slim Dusty Sings (1960), Australian Bush Ballads and Other Old-Time Songs (1965), Beer Drinking Songs of Australia (1986), and G’Day, G’Day (1989). He was the first Australian recording artist to receive a gold record (for his quintessential hit “A Pub with No Beer” in 1957), the first Australian entertainer to be granted an MBE (1970), and the first country music performer to appear at the Sydney Opera House (1978). In 1964, Dusty initiated the ‘Slim Dusty Tour’, his first such annual music tour around Australia that covered a total distance of 30,000 miles and went on for ten months. Dusty recorded not only songs written by himself and other fellow Australian performers but also classic Australian poems by Henry Lawson and Banjo Paterson, with new tunes to call attention to the old “bush ballads”. In 1970, Dusty was made a member of the Order of the British Empire for services to music. In 1973, he won Best Single at the inaugural Country Music Awards of Australia at the Tamworth Country Music Festival (McKean won Song of the Year as a writer of “Lights on the Hill”). In all, he won a record 37 “Golden Guitars” over the years. From then on, the Slim Dusty career was assured. Unmistakable in his workman’s hat with the turned down brim, Slim was the kind of country music performer America lamented having lost. He was someone who, throughout his 100-album career, sang songs about the Australian landscape and the people who occupy it, someone who toured the length and breadth of the land. The cream of Australian songwriters lined up to offer him songs. In 1979 Dusty published his autobiography, ‘Walk a Country Mile’, which eventually emerged as a bestseller in Australia. An album that was released with the same title went platinum. In 1981, the 50th album of Dusty, ‘The Golden Anniversary Album’ achieved multi-platinum status in Australia. In 1983 he became the first ever singer in the world whose voice was beamed to Earth from space when the Australian bush ballad ‘Waltzing Matilda’ recorded in his voice was played by astronauts John Young and Bob Crippen, while space shuttle ‘Columbia’ passed over the orbit of Australia. Dusty recorded and released his 100th album, Looking Forward, Looking Back, in 2000 and became the first artist in worldwide commercial recording history to do so; the second was Cliff Richard. All 100 albums had been recorded with the same record label, EMI, making Dusty the first music artist in the world to record 100 albums with the same label. He was then given the honor of singing “Waltzing Matilda” in the closing ceremony of the 2000 Summer Olympics, with the whole stadium (officially 114,714 in attendance, the largest in Olympic history) singing along with him. 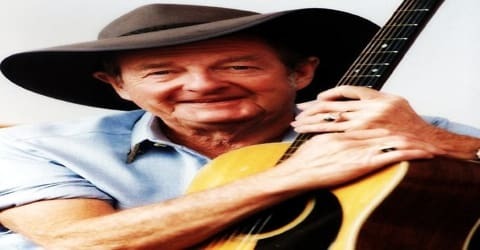 Slim Dusty also was the founding president (1992–2001) of the Country Music Association of Australia, the author of an autobiography, Walk a Country Mile (1979), and the subject of a 1984 film biography. Dusty was the last working on ‘Columbia Lane – the Last Sessions’, his 106th album for ‘EMI’. On March 8, 2004, posthumously, the album reached number one position on the country charts and later went gold. 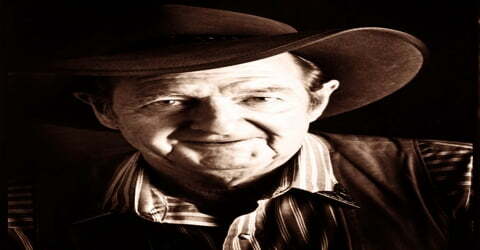 Slim Dusty received countless awards from 1970 to 1990s. In January 1998, Dusty was honored with the title of officer of the ‘Order of Australia’ for his contribution to music. 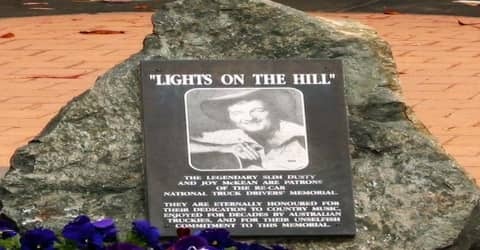 Slim Dusty died at his home in St Ives, New South Wales, on 19 September 2003 at the age of 76 after a protracted battle with lung and kidney cancer. He was given a state funeral at the’ St Andrew’s Cathedral’ in Sydney which was attended by prominent personalities including the then Prime Minister of Australia, John Howard, leader of federal opposition, Simon Crean apart from family, friends, statesman, musicians and thousands of fans. His cremation was performed at the ‘Northern Suburbs Crematorium’ in Sydney. In 1957 Dusty recorded his most remarkable song, ‘A Pub with no Beer’ that soon charted as the best-selling record by an Australian singer. The song was the first Australian single that went gold and remained the sole 78rpm record that won a gold disc. The Dutch and German cover versions of the song that were released by Flemish country singer Bobbejaan Schoepen in 1959 and 1960 emerged as number one hit song in Germany, Belgium and Austria. His importance to the Australian music landscape was immense. Just one example of his homeland’s pride came in September 2000, when he was one of the Australian performers featured in the closing ceremony of the Sydney Olympic Games. Slim was given the job of singing Australia’s unofficial national anthem, “Waltzin’ Matilda.” No one else would have been as appropriate. In 2005, a statue of the “Cunnamulla Fella” was unveiled in Cunnamulla, Queensland, in tribute to Dusty and Stan Coster and to the iconic song of that name performed by Dusty with lyrics by Coster. The song recalls Coster’s days working as a sheep-shearing “ringer” around Cunnamulla in the 1950s. Dusty recorded the song and it became an enduring country music hit, later covered by Lee Kernaghan. The statue was unveiled by country music personalities Anne Kirkpatrick (Dusty’s daughter), Jayne Kelly, and Tracy and Russell Coster.